With fifty different styles, your perfect bath chairs awaits you in aluminum, PVC or molded plastic, all with excellent corrosion-proof finishes! Whether elderly, disabled, paralyzed or recovering from surgery, the bathroom harbors danger for anyone with limited mobility. While we always recommend that someone be there to help you bathe, a medical shower chair will provide the durability and support you need to feel balanced and safe. There are several variations of bath chairs for those with disabilities or injuries to choose from to suit the unique needs of each user. Need a combination chair? 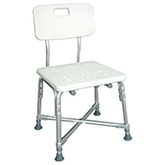 Our Shower Commode Chairs have wheels with locks, transfer benches, and padded seats. Combine with a Transfer Bench to make transfer easy from walker, wheelchair or standing position. This special feature is especially helpful to stroke survivors with a weak side or patients recovering from a hip surgery. Portability essential? Folding Shower Chairs offer easy transport and storage. If a relative or friend does not have the equipment they need, the user can easily bring their shower chair with them. We offer a Folding Shower Seat with a bag for travel and a Portable Bath Bench with a sturdy assistance handle. Bariatric needs? Any person weighing up to 600 lbs can find the support, ease and maneuverability they need while showering with a heavy duty Bariatric Bath Chair. Twenty are available with weight capacities including 400 lbs., 500 lbs., 600 lbs., and 1000 lbs. Only a rolling chair will do? For paraplegic care, the Rolling Shower Chair is the most ideal bathing solution. 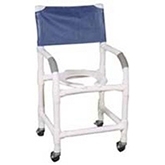 Offering comfort, safety and convenience, a chair with wheels will provide all the support and versatility the patient needs to make shower time quick and easy. Tilting required? Our Tilting Chairs roll, have open fronts, many positions, and quick-drying mesh to make bathing easy for user and caregiver alike. Pediatric needs? Our Pediatric Bath Chairs have optional stands and wheels making it the safest bathing choice for children with disabilities. What different types of bath chairs are available? Our website offers a variety of bath chairs to suit your needs. For example, a bariatric bath bench can support people weighing over 400 lbs. Depending on the back support you need, there are bath chairs with back rests and bath chairs without backrests. Bath lifts use battery power to lower and raise a person in and out of the bathtub. Rolling shower chairs offer the convenience of having the ability to transport the person to and from the bathroom. 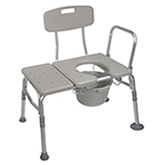 There are also a few bath chairs that combine features to serve many different needs, such as a Shower Commode Transfer Bench. 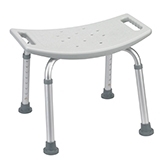 Please refer to the Bath Benches & Shower Chair category page for a list of all of the different bath chair available. What is the difference between a standard bath chair and a bariatric bath chair? The difference between a standard bath chair and a bariatric bath chair are the amount of weight they can support. A standard bath chair can typically support up to 300 lbs. A bariatric bath chair can support a minimum of 400 lbs. and a maximum of 1000 lbs. ; however the majority of bariatric bath chairs have a weight capacity of 600 lbs. How does a bath chair commode differ from a standard commode? A bath chair commode is created to be used in the water, and in the shower or the bath tub. A standard commode chair is made to be used next to the bed or over an existing toilet, and outside of the shower or bath tub. What is the purpose of a transfer bench? 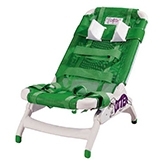 A transfer bench is used to easily transition a person into or out of the bath tub. This bench features an extended length that straddles the side of the tub and a seat on the inside of the tub. To enter the bath tub, a person can sit on the outside length, swing their legs over the tub wall and slowly slide across the bench into the tub. How much weight can a bath chair support? Please see the answer to the question above regarding the difference between a standard bath chair and a bariatric bath chair. What material are bath chairs made from? Bath chairs feature a heavy duty molded plastic construction to provide strength and comfort. The chair is supported by an aluminum frame that is not only lightweight and durable but corrosion-proof to prevent rusting and help dry quickly. Yes there are several bath chairs that we carry on our website that can be easily transported. 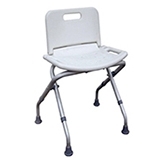 Though there are many lightweight chairs suited for travel, folding bath seats are the most portable type of bath chair as they are fold for convenient storage and feature a handle for carrying. How difficult is it to assemble a bath chair? From rolling shower chairs to bath lifts, bath chairs are generally simple to assemble and often do not require any tools to put together. A few bath chairs with complex designs will be delivered fully assembled for customer convenience. Will a bath chair work in the shower and vice versa? Many bath chairs work in both the shower and bath, however some bath chairs are made specifically for use with the bath tub or shower. 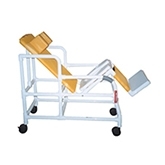 Transfer benches and bath lifts are made for use in the bathtub while a rolling shower chair is made for use with the shower. Please refer to the product description of each product to determine if the bath chair is compatible with the bath tub, shower or both. How do I know if a bath chair will work with my existing bath or shower? Before making a purchase, we suggest measuring the length, width and depth of your bath tub or shower and compare this measurement to the chair you like. This will let you know if the chair will fit in your bathroom and prevent a future return or exchange.